Pope Adrian IV (Latin: Adrianus IV; born Nicholas Breakspear; c. 1100 – 1 September 1159) was pope from 4 December 1154 to his death in 1159. Adrian IV is the only Englishman (as of 2016) to have occupied the papal throne. It is believed that he was born in Bedmond in the parish of Abbots Langley in Hertfordshire and received his early education at the Abbey School, St Albans. Nicholas' father was Robert, who later became a monk at St Albans. Nicholas went to Paris and later became a canon regular of the cloister of St Rufus monastery near Arles. He rose to be prior and was then soon unanimously elected abbot. This election has been traditionally dated to 1137, but evidence from the abbey's chronicles suggests that it happened about 1145. His reforming zeal as abbot led to the lodging of complaints against him at Rome; but these merely attracted to him the favourable attention of Pope Eugene III, who created him Cardinal Bishop of Albano in December 1149. From 1152 to 1154 Nicholas was in Scandinavia as papal legate, establishing an independent archepiscopal see for Norway at Trondheim, a place he chose chiefly in honour of St Olaf. This led him to create the Diocese at Hamar, and, according to tradition, to form cathedral schools in Norway's bishopric cities. These schools were to have a lasting effect on education and Catholic spirituality in Norway (even after the Reformation in Norway). (Norway's cathedral schools persisted, although they later lost their formal ties to the church.) Nicholas made arrangements which resulted in the recognition of Gamla Uppsala (Old Uppsala) as seat of the Swedish metropolitan in 1164 (later moved to Uppsala). As compensation for territory thus withdrawn, the Danish archbishop of Lund was made legate and perpetual vicar and given the title of primate of Denmark and Sweden. Nicholas was accompanied to Scandinavia by another English-born priest, Henry, Bishop of Finland (d. 1156), who would later be venerated by Catholics, Lutherans and Anglicans as Saint Henry of Uppsala. On his return to Rome, Nicholas was received with great honour by Pope Anastasius IV. 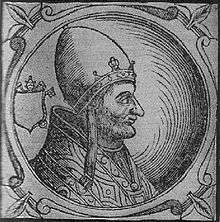 On the death of Anastasius, Nicholas was elected pope on 3 December 1154, taking the name Adrian IV. He at once endeavoured to bring down Arnold of Brescia, the leader of the anti-papal faction in Rome. Disorder within the city led to the murder of a cardinal, prompting Adrian, shortly before Palm Sunday 1155, to take the unheard-of step of putting Rome under interdict. This act greatly diminished the seasonal influx of pilgrims, thus damaging the local economy. Without Easter services the pilgrims would not visit; thereupon, the Senate (City Council of Rome) exiled Arnold, and the pope, with the cooperation of the newly arrived Frederick I (Barbarossa), procured Arnold's execution. In 1155, three years after the Synod of Kells, Adrian IV published the Papal Bull Laudabiliter, which was addressed to the Angevin King Henry II of England. He urged Henry to invade Ireland to bring its church under the Roman system and to conduct a general reform of governance and society throughout the island. The authenticity of this grant, the historian Edmund Curtis says, is one of "the great questions of history." He states that the matter was discussed at a Royal Council at Winchester, but that Henry's mother, the Empress Matilda, had protested, and the expedition was put off to another time. The Normans invaded Ireland in two stages. Dermot McMurrough invited a small number of Norman knights led by Gilbert de Clare, 1st Earl of Pembroke in 1169 to help in a local war, and they were rewarded with grants of land. Fearing that they might create an autonomous power, Henry II landed with a much larger force in 1171. In November 1171 Henry accepted the fealty of the Dublin Vikings, the Gaelic kings and the Norman knights. Henry's action was approved by Pope Alexander III and the Synod of Cashel met in 1172. Laudabiliter came to be seen as the first step in a process, but modern historians think it less important. At the diet of Besançon in October 1157, the legates presented to Frederick I a letter from Adrian IV which alluded to the beneficia or "benefits" conferred upon the Emperor, and the German chancellor translated this beneficia in the feudal sense of the presentation of property from a lord to a vassal (benefice). Frederick was infuriated by the suggestion that he was dependent on the Pope, and in the storm which ensued the legates were glad to escape with their lives, and the incident at length closed with a letter from the Pope, declaring that by beneficium he meant merely bonum factum or "a good deed," i.e. the coronation. The breach subsequently became wider, and the Emperor was about to be excommunicated when Adrian died at Anagni on 1 September 1159, reputedly choking on a fly in his wine, but probably of quinsy. Among a group of modern houses in the village of Bedmond near St Albans is a small plaque recording the spot as his birthplace, historically in the parish of Abbots Langley. Today the village has several streets named after him, including Popes Road, Adrian Road and Breakspeare Road. ↑ Clark, Clive W. (1997). "Prologue". Abbots Langley Then 1760–1960. 143 Sussex Way, Cockfosters, Herts, EN4 0BG: Clive W. Clark. p. 1. ISBN 0-9531473-0-4. ↑ St Albans Cathedral Archived 9 June 2009 at the Wayback Machine. ↑ The protestant Reformation began in Norway during the 1520s, under King Christian III of Denmark. A late example of Nicholas Breakspear's influence is Scandinavia's most creative and forceful Counter-Reformation figure, the Jesuit Laurentius Nicolai Norvegicus (born Laurids Nielsen; c. 1539–1622), who attended Oslo Cathedral School in his youth. ↑ Burke, O.P., Very Rev. Thomas N. (1873). "1". English Misrule in Ireland: A Course of Lectures in Reply to J. A Froude. 1. New York: Lynch, Cole & Meehan. p. 27. ↑ Curtis, Edmund (2002). A History of Ireland from Earliest Times to 1922. New York: Routledge. pp. 38–39. ISBN 0-415-27949-6. ↑ O’Hegarty, P. S. (1918). "1". The Indestructible Nation. 1. Dublin & London: Maunsel & Company, Ltd. p. 3. ↑ Herbermann, Charles, ed. (1913). "Boso (Breakspear)". Catholic Encyclopedia. New York: Robert Appleton Company. . Henry Birt says that Boso was a cardinal-nephew of Adrian IV, but Arthur Ua Clerigh finds no evidence. More recent sources say that this is incorrect (B. Zenker, Die Mitglieder des Kardinalkollegiums von 1130 bis 1159, Würzburg 1964 p. 149).